With Us The Duo’s new album Just Love, recorded after two years of explosive social media fame, widespread press and TV attention, national touring, a major-label album, and recent self-declared independence, the husband-and-wife musical team of Michael and Carissa Alvarado find themselves — to borrow a lyric from one of their songs — right where they should be. 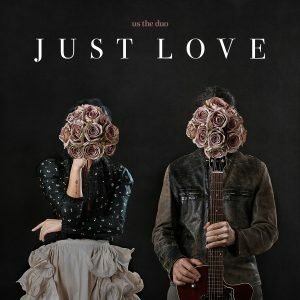 Just Love, the first album by the Southern California-based singing/songwriting couple since 2014’s No Matter Where You Are, was recorded at The Smoakstack Studio in Nashville with co-producer Nathan Thomas. Just Love features 11 new original songs by the Alvarados. Their crisp, affecting pop delivers its intimate emotion in the same way that Us The Duo has always communicated with their fans: directly, and from the heart. The new release reflects the Alvarados’ roots as independent artists who grew an immense following by addressing their listeners on social media. Posting a series of six-second musical clips on the video-sharing site Vine to promote their self-produced debut album, the couple quickly amassed a rabid fan base that now totals 10 million devoted followers. Their Internet fame led to conversations with Universal Republic Records that climaxed with the signing of a record deal. In rapid succession, their song “No Matter Where You Are” — a musical rendering of their wedding vows — was used in the 2014 animated feature The Book of Life; Oprah Winfrey, an avowed fan of the song and Us The Duo, took them on her 2014 “The Life You Want Weekend” national tour; Universal Republic released a full-length album; and the Alvarados received enthusiastic coverage in such press outlets as People, Entertainment Weekly, Billboard, Variety, and the Hollywood Reporter. However, even as Us The Duo received a high-profile contract and the kind of attention every performer dreams of, they found their professional situation was pulling them away from their creative ideals and their musical origins, and they decided to exit their label deal. In bold contrast to most contemporary pop albums, which are made using platoons of musicians and songwriters and employing a multitude of studio techniques, Just Love was created by the Alvarados with a small team of players, and the collection features the writing of the Alvarados (who collaborated with producer Thomas on five numbers). It was cut live with only minimal overdubs. The result is a soulful album that reflects the couple’s musical bedrock – the soul of Earth, Wind & Fire, Michael Jackson, and Prince, hip-hop forebears like Lauryn Hill, and the jazz that inspired Michael Alvarado when he was learning to play piano. Us The Duo are supporting Just Love with national touring, alternating arena dates as an opening act with headlining shows of their own.